The data above includes both IVF and ICSI treatment. Donor embryo and oocyte cycles have been excluded. PIVET is committed to performing single embryos transfers. 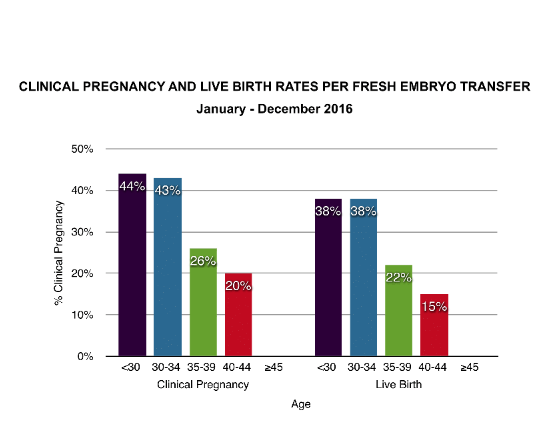 90% of embryo transfers were single embryo transfers in 2016. 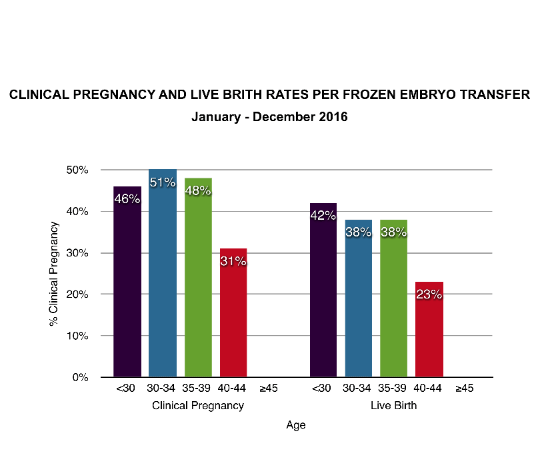 In 2016, PIVET has increasingly moved towards a freeze best embryo policy due to the higher chance of pregnancy in frozen embryo transfers. There were no pregnancies or live births in women ≥45 yrs old at PIVET in 2016. The presence of an intrauterine sac (with or without foetal heart) observed on 7 week ultrasound scan. If a pregnancy is ongoing at 20 weeks. A live birth is defined as: The complete expulsion or extraction from the mother of a baby which shows evidence of life. Your live birth rate for your age group is the most meaningful chance of your success. Success rates may be affected by a number of factors which include the type of treatment undertaken, the cause of infertility, age, lifestyle factors, genetic factors and quality of the eggs and sperm. Please be aware, depending on the cause of your infertility or reasons for undertaking treatment not every treatment cycle undertaken will result in an egg collection, an embryo transfer or embryos to freeze. Please visit this site for more information about interpreting pregnancy rates. Our friendly team at PIVET can also be contacted for further information.